CLICK ON RED HIGHLIGHTED WORDS IN POSTS TO VIEW LINK. NCSU has been updating their online resources. Most of our links go to their researched information. Therefore, some of our older links no longer work. We are working on fixing outdated links as we become aware of them and apologize if you are led to a defunct site. A native tree growing in our Butterfly Garden is the Halesia carolina (commonly known as the Carolina Silverbell Tree. ) This is a spring flowering understory tree. This tree is a host plant to several butterflies. Honeybees and bumblebees enjoy nectar from the blooms. Birds eat the buds and flower clusters. All our plants are divided and potted up, and the seeds we planted are sprouting. Master Gardener Volunteers are tending them so they become well established plants for the May 18th Plant Sale. We are shooting for last year's count of close to 4,000 plants. This red amaryllis has decided to bloom a bit earlier than expected. It and many more will be available at the sale. The ruby-throated hummingbirds have arrived. You could fill up feeders and tend to them all summer. 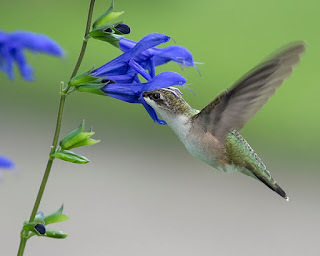 (Find all the directions here for that: HUMMINGBIRD GUIDE ) Or you could add flowering plants to attract them to your garden. One such plant is Salvia guaranitica 'Black and Blue'. We will have this plant at our PLANT SALE on May 18th. 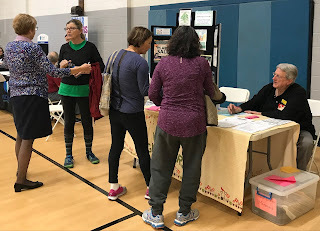 Several Master Gardener Volunteers were at the Senior Health Fair last week to answer gardening questions. Starting May 4th, and then for the first Saturdays of the summer months, they will be at the Leroy James Farmers' Market from 8:00-11:30 AM. It is a good time to head out to the Arboretum to see what plants have started to emerge from their winter sleep. A lot of new plants have been added (thanks to all of you who have supported us by attending the speaker event in January and our past plant sales). A good place to begin your self-guided tour is to start at the What's In Bloom Display under the Green Roof Shelter. Ten plants of interest are selected each week. Their names and locations in the gardens are listed on the white board. Increase consumer and green industry (nurseries, garden centers, and landscapers) knowledge and adoption of proper plant selection, cultural practices, and pest management that will maximize plant performance, economic resources, and protect the environment. Growth of the Arboretum depends on funds raised at our Speaker Events, Plant Sales, and donations. You can help support The Arboretum by donating to our Enhancement Fund. Online contributions may be made at this secure site: GIFTS. Click below for directions to the Arboretum. Master Gardener Volunteers will lead free guided walking tours for groups. Tours can be scheduled by calling 252-902-1709. The Arboretum is open for self-guided tours year round, seven days a week from dawn to dusk, free of charge. Pick up a 'Visitors Guide' under the shelter in front of the Ag Center to begin your tour. 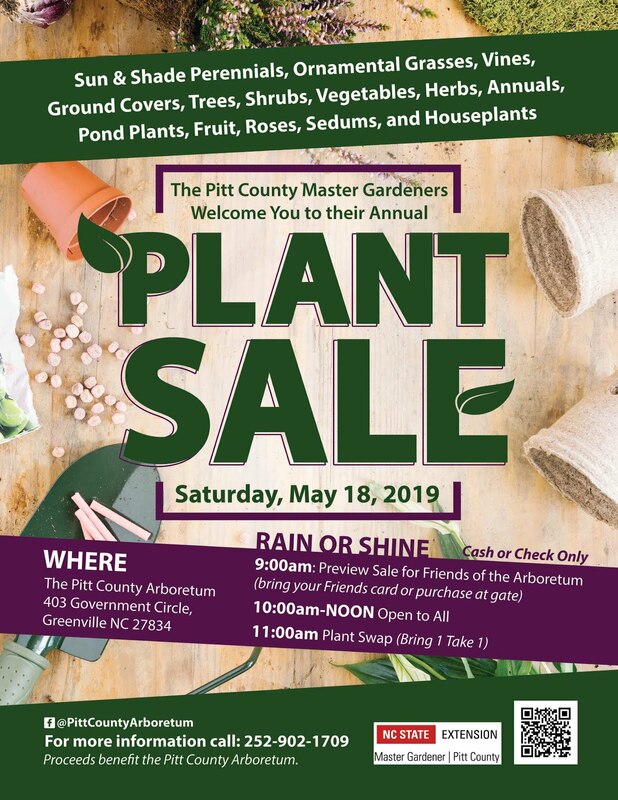 Begun in 1998, the seven-acre Arboretum surrounding the Pitt County Agricultural Center shows what you can do in your home garden. Four season color; drought-tolerant plants, perennials, vegetables, herbs, roses, a children's garden, wildflowers, fruits, container gardens, a tree and shrub collection, and more await you. Do you have gardening questions? Need a plant ID? Having problems with pests or diseases? Extension Master Garden Volunteers are available to answer your questions. *Call the HOTLINE at 252-902-1705 or drop by the office at 403 Government Circle, Monday and Thursday 10:00 AM until Noon. *Leave a message anytime and they will return your call during the scheduled time above. To help support and expand our beautiful Arboretum and to strengthen our teaching, demonstration, and outreach programs, become a Friend of the Arboretum. Started in 2002, the nonprofit Friends organization plays a critical role in preserving and perpetuating an important local cultural resource. The Arboretum depends on memberships and gifts for our operating expenses. Friends enjoy many benefits including early admittance to our annual plant sale, discount ticket price for our January Speaker Event, access to our horticultural library, and discounts at local gardening shops. Call 252-902-1709 for an application.